A. The route to 10.2.0.0/16 was redistributed into EIGRP. B. A default route has been redistributed into the EIGRP autonomous system. C. R1 is configured with the ip summary-address command. D. R1 is sourcing an external EIGRP route from Null0. F. R1 is configured with the variance command. Refer to the exhibit. 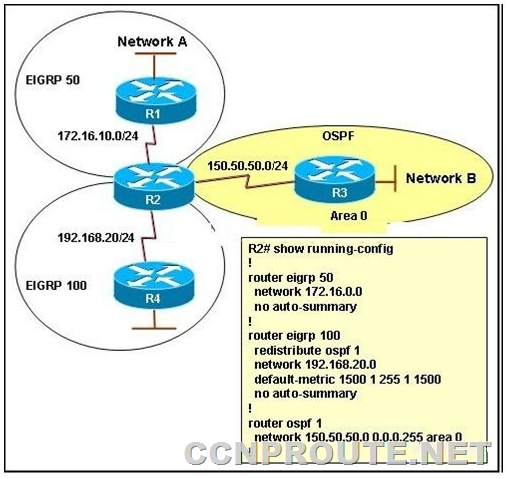 The routing protocols EIGRP and OSPF have been configured as indicated in the exhibit. 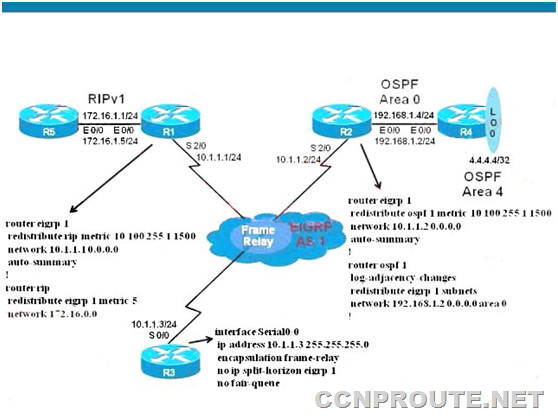 Given the partial configuration of router R2, which network will be present in the routing table of R4? In this exhibit the OSPF domain is redistributed into the EIGRP 100 domain so Network B will present into Router R4. However, the Network A network will not be seen on router R4 (The bottom router which is improperly labeled Network B) because EIGRP 50 was not redistributed into EIGRP 100. What can you conclude about this network? Select the best response. A. The network has been stable for at least the last 45 minutes. B. There is a flapping link or interface, and router C knows an alternate path to the network. C. There is a flapping link or interface, and router A does not know an alternate path to the network. D. EIGRP is not working correctly on router C.
E. There is not enough information to make a determination. Refer to the exhibit. Looking at the topology diagram and the partial router configurations shown, which statement is true? Select the best response. A. A routing loop will occur due to mutual route redistribution occurring on R1 and R2. B. Suboptimal routing will occur due to mutual route redistribution occurring on R1 and R2. 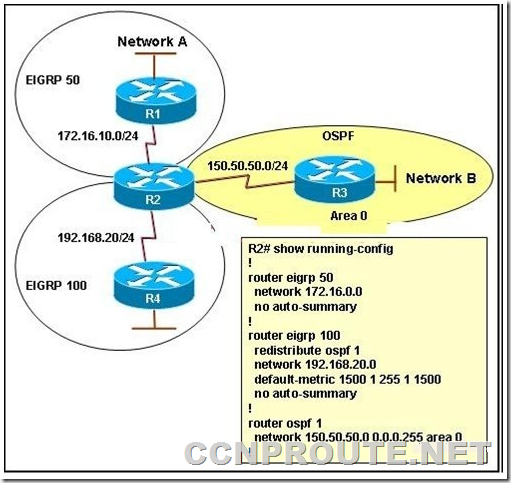 C. Additional route filtering configurations using route maps and ACLs are required on the R1 and R2 routers to prevent routing loops. D. R2 will not be able to redistribute the EIGRP subnets into OSPF, because R2 is missing the default seed metric for OSPF. E. The 10.1.1.0/24 subnet will appear as 10.0.0.0/8 in the R5 routing table. Refer to the exhibit. The Route.com company is running EIGRP between all the routers. Currently, if one of the LAN links (LAN1 or LAN2) at the headquarters flaps (goes up and down), the HQRTR1 and HQ-RTR2 routers will experience high CPU usage and have a long EIGRP convergence time. As the new network administrator, you are asked to investigate this situation and determine if there is a quick way to resolve this issue. Which is the most important thing that you can quickly verify first to resolve this issue? A. Verify that the bandwidth setting on all WAN links is correct. 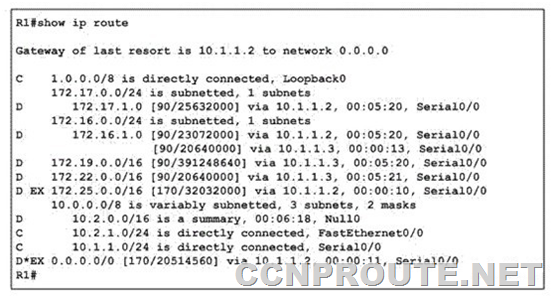 B. Verify that the HQ-RTR1 and HQ-RTR2 routers are configured to send only a default route to all the spoke routers. 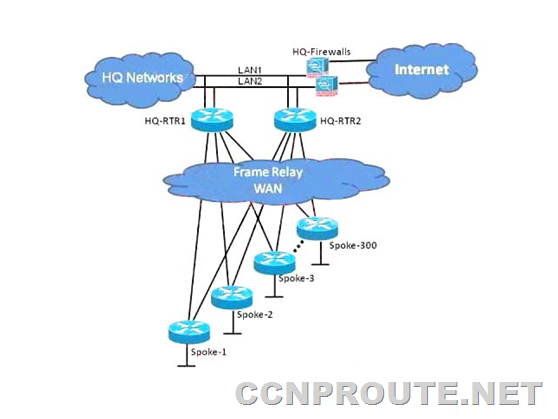 C. Verify that the HQ-RTR1 and HQ-RTR2 routers are configured for EIGRP Nonstop Forwarding. D. Verify that all the spoke routers are configured for autosummarization. E. Verify that all the spoke routers are configured as EIGRP stub.